Huge Savings Item! Free Shipping Included! Save 19% on the ECR4Kids Assorted Colors Sand and Water Adjustable Activity Play Table Center with Lids, Square (4-Station) by ECR4Kids at Indsight. MPN: ELR-0799. Hurry! Limited time offer. Offer valid only while supplies last. The ECR4Kids Four Station Square Sand and Water Table with Lids promotes tactile discover, fine motor skills, social interaction and most of all fun. The ECR4Kids Four Station Square Sand and Water Table with Lids promotes tactile discover, fine motor skills, social interaction and most of all fun. The six stations can be connected in multiple configurations using the included fasteners for stability. The basins are removable for cleaning and drainage. Translucent lids are included to keep the center enclosed when not in use. 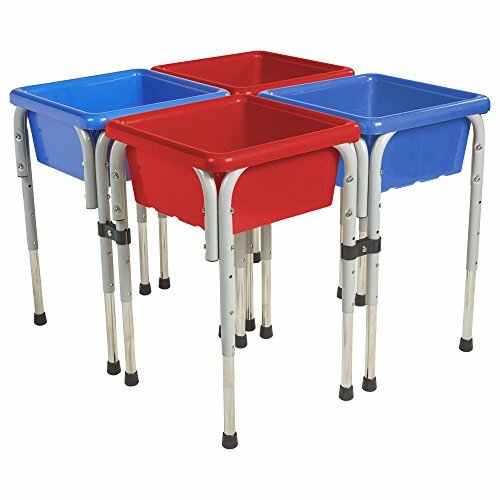 Stations feature strong steel legs that are adjustable to 20", 22.5", or 26" high to accommodate children of different heights. ECR4Kids Sand and Water Play Tables have achieved GREENGUARD [GOLD] Certification and are CPSIA-compliant for safety.